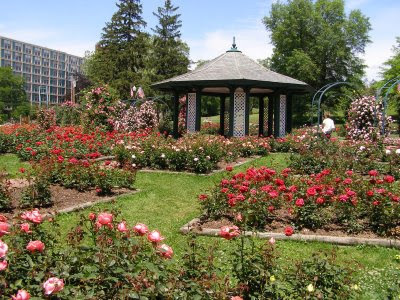 A favorite spot on Syracuse's East Side, and from the University is the Edmund Mills Rose Garden created in 1923 at the corner of Ostrom Avenue and University Place, just on the edge of Thornden Park by the Syracuse Rose Society, which still maintains it. This formal garden, with its central pavilion surrounded by radiating trellised paths adorned with approximately 400 types of Roses (10,000 plants in all) is a favorite spot for wedding and graduation photos, and just for casual visitors. 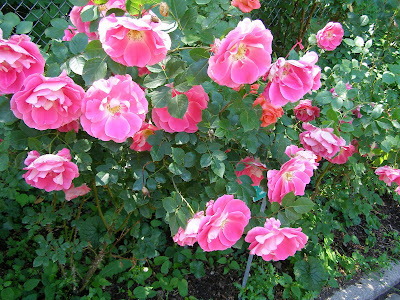 The roses are in bloom in June, and I visited the other day. Summer is here and since I’m not planning too much travel this year, I thought I’d make of point of revisiting all the city parks, and others in our region. What better way to start then with those wonderful green spaces within walking distance of my house. I am fortunate to live a neighborhood - the Westcott Neighborhood - where much that I need is in easy walking and biking distance. This includes two large urban parks - Thornden and Barry. I live between the two, and can be in the heart of each within fifteen minutes on foot, and just a few minutes by bike. Both of these parks are heavily used, but given the wear and tear of that use both parks look good and are well maintained. The other day I biked around Thornden and took these pictures…If you haven’t used Thornden Park yourself, its worth a visit. The Rose Garden is in full bloom, and the public swimming poll is one of the best in the city. Thornden is a scenic park - developed out of a 19th-century English landscape style private estate developed by Alexander H. Davis after he purchased the property from James Haskins in 1875. Haskins had bought what had been farmland from the Ostroms (after whom Ostrom Avenue is named), twenty years earlier. 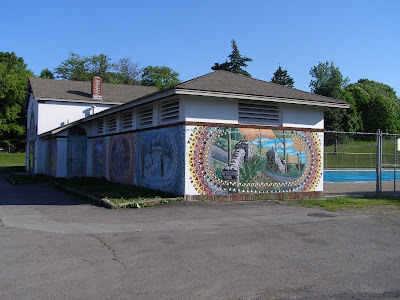 Thornden listed on the State and National Registers of Historic Places as an historic designed landscape. Davis named his new estate Thornden and rebuilt Haskins house as an enlarged Tudor retreat, and he developed the grounds partly as an arboretum, partly as a hunting park, and he even included a small golf course. Only parts of Davis’s built vision are preserved at Thornden, but the picturesque quality of the landscape, the variety of plantings and mixed use character of the tract remain. 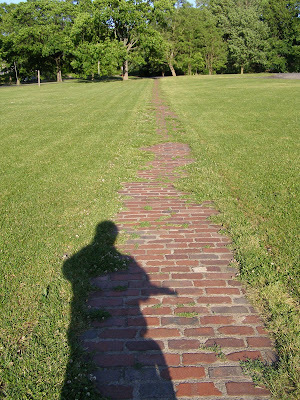 The City of Syracuse bought the seventy-five acre parcel in 1921 and began its transformation into a public park. 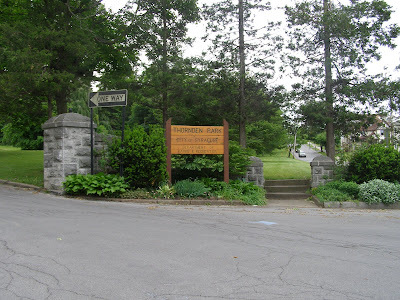 Unlike New York City which has to create its great urban parks out of wasteland, Syracuse was able to create a public recreation area in the style and spirit of a Frederick Law Olmstead Park almost ready made. 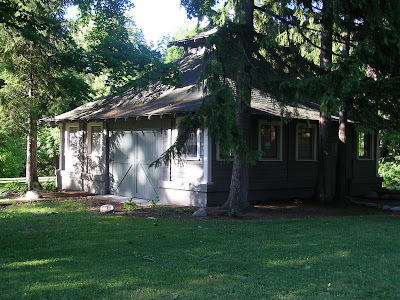 The carriage house, which, is thought to be part of the original greenhouse complex of the Davis estate, was restored by the Thornden Park Association which was founded in 1983 (at a time when the park was suffering deterioration and neglect) and since that time has spearheaded the successful effort to restore beauty, utility and regular use to the park. The restored Carriage House, a left-over from the David estate. 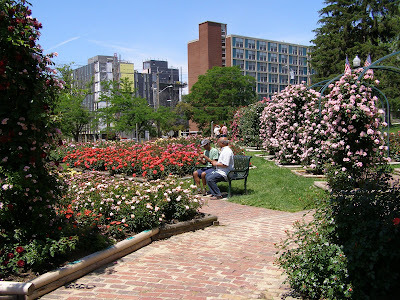 A notable formal exception to seeming informality of the rest of the park is the Edmund Mills Rose Garden created in 1923 at the corner of Ostrom Avenue and University Place. by the Syracuse Rose Society, which still maintains it. This formal garden, with its central pavilion surrounded by radiating trellised paths adorned with approximately 400 types of Roses (10,000 plants in all) is a favorite spot for wedding and graduation photos, and just for casual visitors. 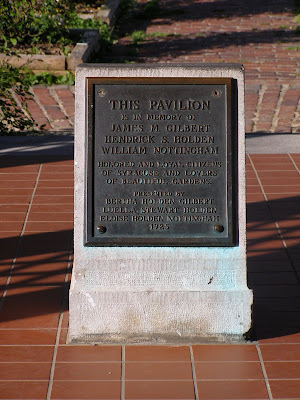 During the 1920s and 1930s the City added more and more public amenities including a swimming pool in 1927 and the WPA-created amphitheater (on the site of the Haskins trout pond) in 1930. The amphitheater consists of six rock faced terraces which once supported rows of wooden benches. 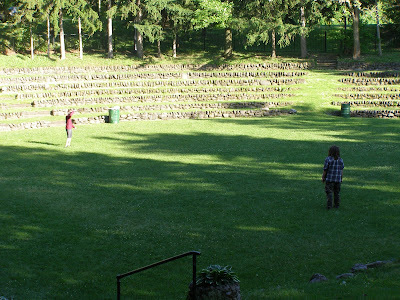 The amphitheater was restored in 1989 and is now frequently used for concerts and other events, but spectators bring their own chairs and blankets. Just above the amphitheater is a stone field house, which in winter is the site of the Thornden Park Association’s popular chili fest. 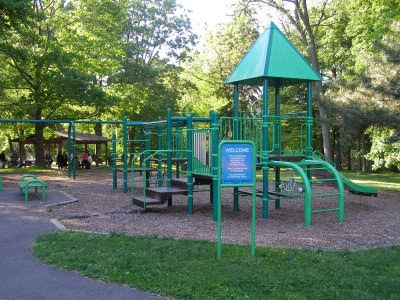 Later, a large playing field was created, basketball courts were installed, and just a few years ago a new play ground was inaugurated. 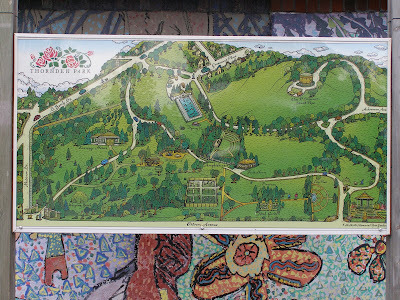 Still, the overall appearance and feel of Thornden Park is of open rolling country, with new visual stimuli openings up at almost every turn and rise.